No Bears, by Meg McKinlay and Leila Rudge, the team who brought us Duck for a Day, is the best! 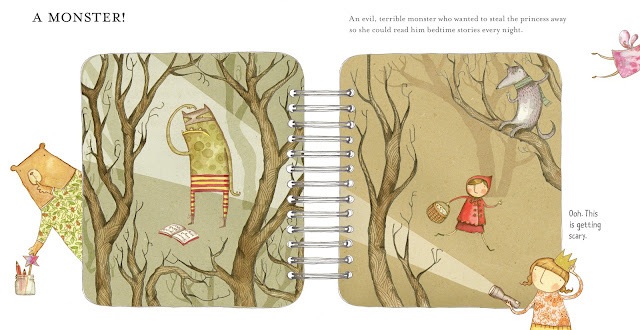 I just love a picture book where the words tell one story and the pictures another, and No Bears is exactly that. 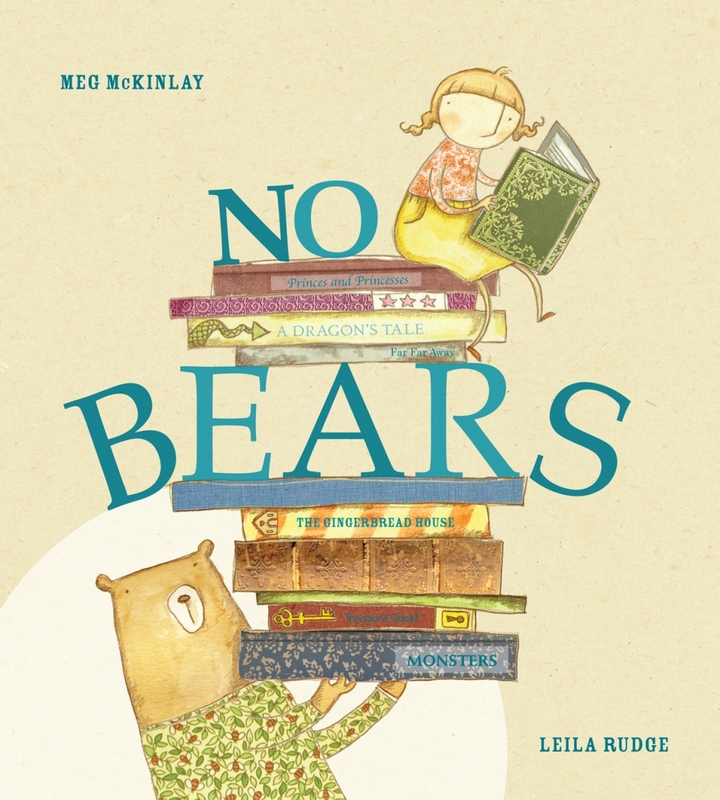 Meg McKinlay's main character and narrator, Ella and her bear-less story is perfectly matched to Rudge's detailed, delicately colored, magical illustrations. No Bears begins, "Hi! I'm Ella, and this is my book. You can tell that it's a book because there are words everywhere. Words like ONCE UPON A TIME and HAPPILY EVER AFTER and THE END. I'm in charge of the book, so I know everything about it - including the most important thing, which is that there are NO BEARS in it. I'm tired of bears. Every time you read a book, it's just BEARS BEARS BEARS - horrible furry bears slurping honey in awful little caves. You don't need BEARS for a book." And really, when I think about it, Ella has a point. Bears seem to be the most frequently represented creatures from the animal kingdom in picture books. From the Three Bears, Paddington and Corduroy to Karma Wilson's Bear books, DB Johnson's Henry books to Otto the Book Bear and Bonnie Becker's crotchety Bear to Jon Klassen's stoic in I Want My Hat Back, to name just a few. No wonder Ella is tired of bears in books. But, it seems you just can't keep bears out of books. Ella rattles off a list of things you do need for a book, including fairies, princesses, castles, monsters, giants and fairy godmothers. Ella begins to tell her story, "Once upon a time there was a beautiful princess. The princess lived in a farwawy castle with ehr father, the king, and her mother, the queen and her fairy godmother, the fairy godmother. But NO BEARS." 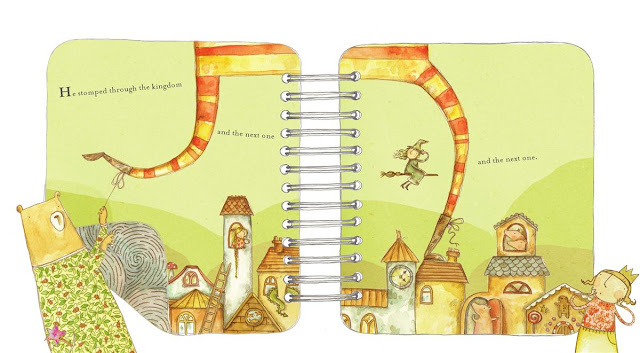 Rudge's illustrations follow the text loyally until the fairy godmother reaches off of her page and points her magic wand at the bear, who was seemingly exiled from Ella's book a page or two earlier. Tagging along in the margins, the bear gets the chance to nab the fairy godmother's magic wand (which is residing in Ella's jar of drawing supplies) and makes mischief as the story unfolds. Or not. It seems that the bear is actually helping from the sidelines while the fairy godmother searches for her wand. A giant makes off with the princess and is thwarted by and untied shoelace. A monster is about to devour the princess when she goes flying up into the air and the monster tumbles down a staircase into the sea. A celebration at the castle, with a full cast of fairy tale characters (minus the bear) brings a happy end to Ella's story and she proclaims, "Wow! This turned out to be a pretty good book, don't you think? In fact, I think that has been the prettiest, most exciting, scariest, and funniest book ever. And I know why! Because there were NO BEARS in it. NOT ONE! So now there's only one thing left to do. And I think you know what that is. It's to say that everyone lived happily ever after. THE END." The final page finds the exiled bear telling the REAL story to the fairy tale cast while Ella admires the book she has just written and illustrated. Brilliant! Such a wonderful story with superb illustrations, but also a jumping off point for creativity - whether it comes in the form of writing, art or conversation, this book will be an inspiration. NO BEARS. Text copyright © 2011 by Meg McKinlay. 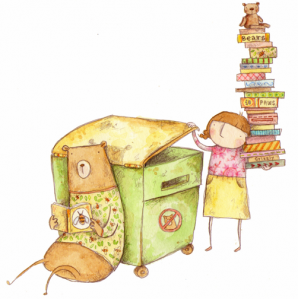 Illustrations copyright © 2011 by Leila Rudge. Reproduced by permission of the publisher, Candlewick Press, Somerville, MA on behalf of Walker Books Australia.